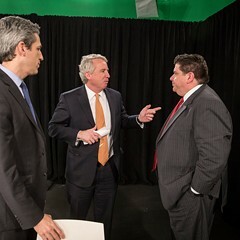 The gubernatorial candidate nailed the whole point of Mayors Daley and Emanuel’s economic development programs. When I moved to Chicago in 1981, the community around the intersection of Clybourn and Division on the north side was overwhelmingly poor and African-American. Now, of course, it's one of the richest and whitest corners of town. I offer this slice of relatively recent history to underscore my puzzlement at the reaction greeting gubernatorial candidate Chris Kennedy's recent comments about Mayor Emanuel and the changing face of Chicago. 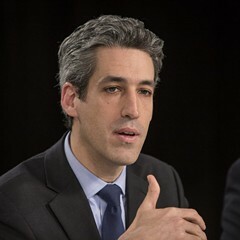 "I believe that black people are being pushed out of Chicago intentionally by a strategy that involves disinvestment in communities being implemented by the city administration," Kennedy said at a press conference last Wednesday in North Lawndale. "I think that's part of a strategic gentrification plan being implemented by the city of Chicago to push people of color out of the city. 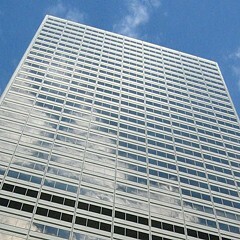 The city is becoming smaller, and as it becomes smaller, it becomes whiter." Since then, Kennedy's been slammed by everyone from the Tribune to Mayor Rahm, who in fact quoted the Trib's editorial to make his case against Kennedy's claim: "The Chicago Tribune referred to it today as imaginary, hallucinatory," Emanuel said. Well, if anyone's hallucinating, it's the mayor and his pals at the Tribune. 'Cause, let's face it, folks, we all know the exodus of tens of thousands of black residents over the last seven years is no figment of Kennedy's imagination. And it's not happenstance—as Kennedy said, it's fostered to a great extent by economic development policies promulgated by the city for decades. OK, yes, there are obviously other factors in these demographic trends, like crime. And I'm not saying these planning policies are directed solely at black residents, as opposed to poor and working-class people in general. Or that Rahm invented these strategies, which began under Mayor Daley. And, yes, Kennedy—a prominent local businessman—was largely quiet about these things until he began his campaign. But by and large Kennedy got it right. Whether the mayor admits it or not, the point of his planning policy is to generate gentrification—that is, to move poor people out and wealthier ones in. Want to get specific? Let's go back to the area around North and Clybourn. In 1981, it was dominated by Cabrini-Green, a public housing project with roughly 30,000 low- income residents, most of them black. I watched and wrote about the systematic dismantling of Cabrini down through the last three decades, much of it through benign neglect. For a long time in the 80s and 90s the CHA allowed the population to dwindle through attrition—as old residents moved out, no new residents were moved in. Then, in the late 1990s, Mayor Daley teamed up with the Clinton administration to tear down Cabrini, promising to build new housing for the residents in a few years. But the housing was never built. And the city doesn't really know or seem to care where the old residents from Cabrini went once the buildings came down—they're just out of the neighborhood. As the population fell, the city closed four of the local schools—Schiller, Byrd, Truth, and Near North High School. Closing the schools gave the old residents one less reason to come back to the neighborhood. All the while, the city seeded new development in the area with property taxes taken from one of several local TIF districts. As I've written many times, the TIF program is intended to eradicate blight in low- income neighborhoods. But in this case, as with so many others in and around the Loop, it was used to help make a gentrifying neighborhood too expensive for the poor people who once lived there. 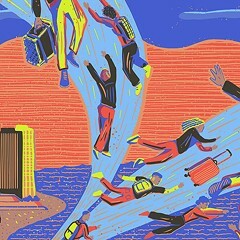 Instead of eradicating poverty, the city was simply moving it somewhere—anywhere—else. Like I said, most of these policies began under Mayor Daley. 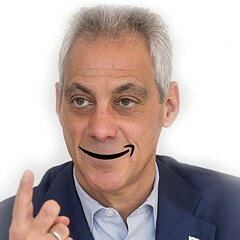 But in 2014, Emanuel tried to add a little icing to the cake when he proposed to build Barack Obama College Prep high school in the area. 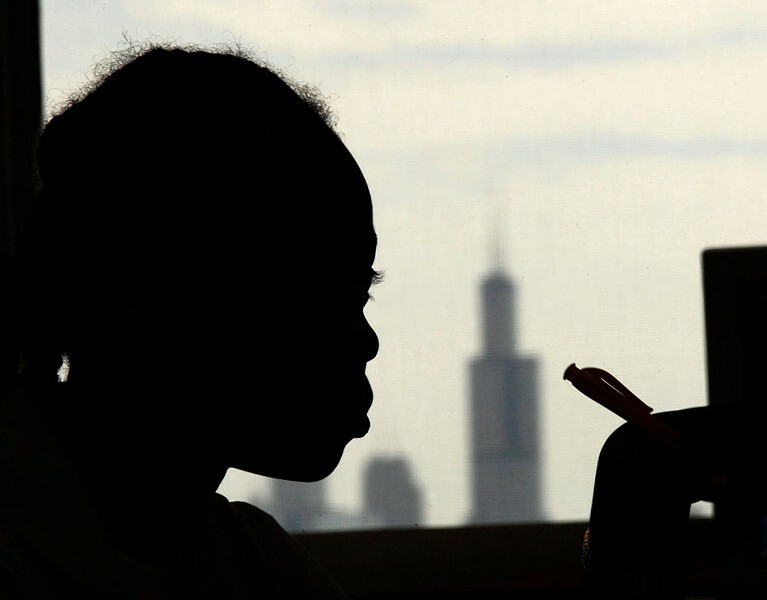 Think about it—the city closed four schools as the black people left. Once white people moved in, the mayor proposed opening a new school. Perhaps he figured by naming it for Obama he'd head off opposition in south- and west-side wards where he was still closing schools. It didn't work, and eventually Rahm pulled back the proposal after a citywide parental uprising. But wait, there's more. To the west of Halsted and Division is an old industrial area that's one of the hottest real estate markets in the city, thanks in part to Cabrini's demolition. Developers are scrambling to buy up the old factories, warehouses, and junkyards and replace them with upscale offices, retail, residential—you name it. It may even be the site of Amazon's headquarters, should that corporate behemoth choose to take Rahm's offer of more than $2 billion in handouts to come to Chicago. To abet this development the mayor is creating—you guessed it—another TIF: the Cortland/Chicago River TIF district, to be exact. With that TIF, the city will divert property taxes from the schools and parks and county and other taxing bodies to seed development in the old industrial corridor by buying land for development, building sidewalks, installing street lights, etc. In short, we'll be spending millions of public dollars to make the area even more prosperous, while the Roselands, Austins, and North Lawndales of the city, choking for development, continue to empty out. To compensate for the tax dollars the schools won't be getting from property in the Cortland TIF district, the mayor will have to raise taxes on everyone else, including poor people on the south and west sides. Thus, Rahm really will be taking from the poor to give to the rich—just as Kennedy said. And life will get that much more expensive, giving poor people one more reason to leave. And so the cycle continues. 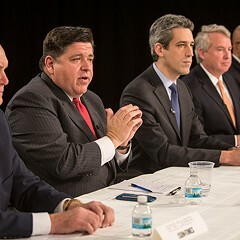 Biss, Daiber, Hardiman, Kennedy, Pritzker—man, I can’t make up my mind.